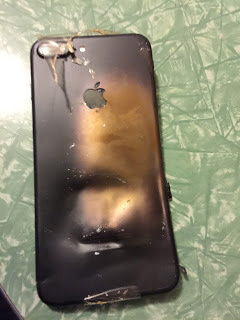 At first is was Samsung Galaxy note 7 and its explosive feature and now the new iphone product having same feature? Terible that is. 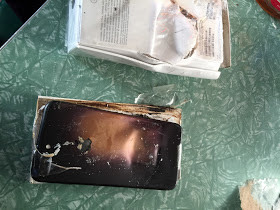 A Reddit user posted on his thread showing a matte black iPhone 7 that exploded while on purchase. 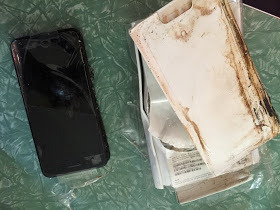 He stated a co-worker pre-ordered the iPhone 7 Plus and was anxiously waiting to get his new machine, only for him to discover the apple phone had already exploded as you can see from the images. 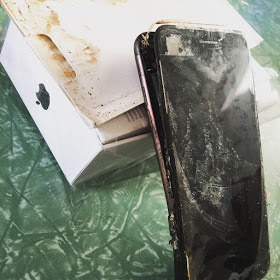 The cause of the explosion is not yet known and Apple are yet to comment on the explosion but many people are already ventilating online that iPhone probably copied Samsung and that's the reason the device is blowing up as well, Funny isn't it ?